The national bird of both Kenya and Botswana, the lilac-breasted roller is often considered one of the most beautiful birds in the world with its pastel plumage, striking field marks, and long tail streamers. It is one of the most colorful members of the Coraciidae bird family, and more than one visitor in Africa searching for mammals leaves the continent a birder, naming this attractive species as their spark bird. This informative fact sheet can help you better understand just how amazing this bird is. This bird's stunning appearance may seem unmistakable, but there are several roller species that share similar habitats and ranges. It is best for birders to learn the key field marks that distinguish the lilac-breasted roller to be sure of the bird's identification. Genders are similar with a white or creamy buff face with a dark eye line and prominent bristles at the base of the thick, black bill. The chin is creamy white, the cheeks are dark tan with a purple wash, and the throat and upper breast are purple, most often a lilac shade but with some hue variation and darker shades lower on the body. The throat and upper breast also show thin white vertical streaks. The upper wings and back are tan, but the shoulders and primary feathers are rich, royal blue. The underparts are bright turquoise. The tail is blue with black outer streamers. In flight, the wings show a light blue leading edge and wingpit contrasting strongly with a dark blue primary and secondary feathers. Legs and feet are greenish yellow. Juveniles are dull overall with shades of brown and tan but develop adult colors quickly, though they lack the outer tail streamers. These rollers have a harsh, raspy call that lasts less than a second but may be quickly repeated. The pitch does not vary, and the tone has a rattling quality. While mostly silent, they are more vocal during the breeding season or when they feel their territory is threatened. These birds prefer open woodland or grassland habitat with widely scattered trees, shrubs, or poles to serve as hunting perches. They are relatively common and widespread throughout much of southern Africa, south of the Congo River basin but extending as far north as Ethiopia in the eastern part of the continent. They are absent from coastal areas of southwestern Africa. Lilac-breasted rollers do not typically migrate but may be somewhat nomadic in search of the best food sources in different seasons or times of drought. Vagrant sightings are regularly recorded in the southern part of the Arabian peninsula, specifically Oman and Yemen. These birds are typically solitary or are found in pairs, but may stay in small family groups during the winter months. All rollers, including the lilac-breasted, are known for their acrobatic, agile flight, aided by the tail streamers they are able to use as rudders while flying. Lilac-breasted rollers perch on high vantage points at the very tops of trees and poles, and stay still while watching for prey to approach. After dropping onto a victim, they may beat their prey against a rock or on the ground to kill it before swallowing it whole. These are carnivorous birds and hunt a variety of small prey, including insects, lizards, scorpions, snails, amphibians, rodents, and even small birds. These are monogamous birds believed to mate for life. The male's courtship displays include stunning flight dives with a rolling or rocking quality as well as loops and twists. These are cavity-nesting birds that usurp old kingfisher or woodpecker holes from 6-30 feet above the ground, and will occasionally nest in empty termite mounds. Both genders aggressively defend their nesting territory, even chasing off much larger raptors and other predators. The eggs are plain white with 2-4 eggs per brood, and only one brood is laid per year. Both parents share incubation duties for 22-24 days, and after hatching, they continue to care for the altricial young for another 18-20 days. Once the chicks have left the nest, they continue to rely on parental care for up to another month. These birds are not considered threatened or endangered, though habitat preservation can help keep their population numbers stable. Poaching for the pet trade is a minor threat that can have severe consequences for local breeding populations. Lilac-breasted rollers have uniquely adapted to one natural disaster. While brush fires can be devastating to many animals and birds, these rollers will deliberately hunt near the edges of fires where panicked prey is fleeing and less wary of predators. These birds do not typically stay near human habitation, but leaving isolated trees or poles available for tall perches can tempt them to visit, especially in less populated regions. Where other nesting sites are scarce, they may use larger nesting boxes. Minimizing the use of pesticides and insecticides can help preserve food sources for lilac-breasted rollers. In the field, lilac-breasted rollers are unafraid when humans approach and it can be easy to get spectacular views and photographs. Visiting wildlife refuges and preserves in the bird's range, especially where there are tall, scattered trees, can help birders be sure of stunning sightings. 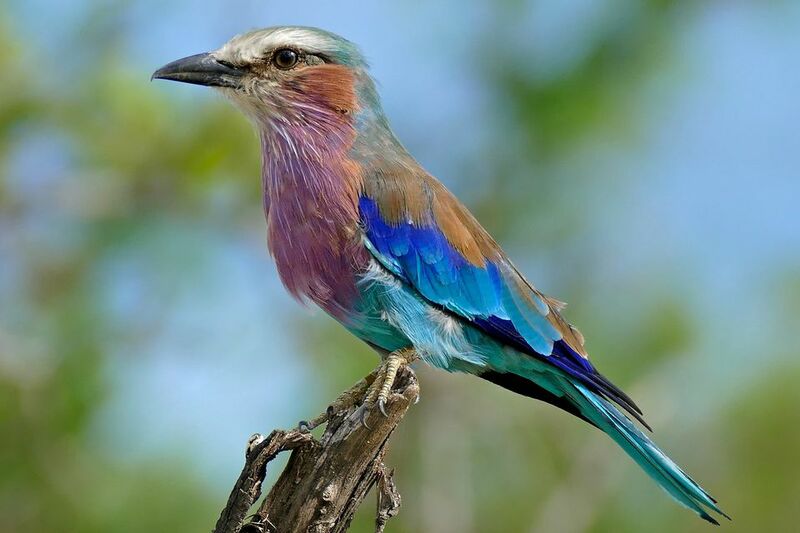 These colorful birds are considered the national birds of both Kenya and Botswana, though the designation is only unofficial and neither nation has an official national bird. In both countries, lilac-breasted rollers can be seen nearly everywhere, though they are missing from some northwestern regions of Kenya. The beauty of these birds and how they attract tourists to the region are great sources of pride in both countries, even without official recognition. There are many other colorful rollers to enjoy, or birders can look for other multi-colored, rainbow-hued birds such as the reddest birds in the world, the world's most beautiful pigeons and doves, or even birds with orange plumage. Be sure to check out all our other amazing bird profiles to see more of your favorite species in every color!